NASA's Commercial Crew and Cargo Program invests financial and technical resources to encourage the private sector to develop and demonstrate safe, reliable and cost-effective space transportation capabilities. 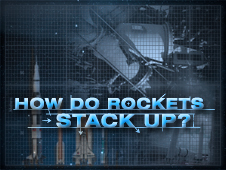 How Do Rockets Stack Up? How does a model rocket stack up against the big guys? Select a rocket and find out. Recently, an air pressurized paper rocket launcher being used by an educator failed. This launcher is described in NASA's Rockets Educator Guide, publications EG-2011-11-223-KSC, pp. 86-90 and EG-2008-05-060-KSC, pp. 86-90. NASA completed an engineering investigation into the failure and determined that the launcher, or design equivalents, should not be used. NASA has removed the launcher design from its website and its education curriculum. Individuals and organizations should immediately discontinue use of the launcher published in the referenced NASA publications. We request that your organization assist NASA in disseminating this information as widely as possible throughout the education community. 1. Main Engine ignites and liftoff occurs. 2. Solid rocket boosters burn off their fuel and separate from the rocket. 3. Booster burns off fuel and jettisons from the rocket. The second stage or engine is revealed. 4. Second stage ignites and pushes the rocket farther along its path. 5. Payload fairing jettisons and reveals the payload. 6. The payload separates from the rocket and begins its mission in space. What Is the Soyuz Spacecraft? What Was the Saturn V? Create a podcast explaining how and why rockets fly. The DLN offers rocketry modules through its free webcasts.